PCIe/104 Types 1 and 2 give the option for high-speed transfers to designers of higher-performance systems. Happy 20th! The PC/104 Consortium celebrates its 20th anniversary. A retrospective on the accomplishments of the PC/104 Consortium through its first 20 years, and an introspective on what to expect in the next. Small size, flexibility, ruggedness, and lower system cost amount to big benefits for users of PC/104 formats. In system design, the first step is choosing a format; The next step is deciding on a PC/104 format that has the ideal processor and I/O functions. 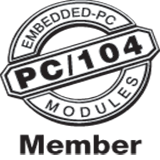 The PC/104 Consortium's family of specifications allows users to leverage the vast array of available standard and custom chip devices. Embedding computers and sensors into everything is the norm, and solutions are becoming more varied every day. With the newly published PCI/104-Express, current and future designers can continue to leverage the vast PC industry technology base. The PCIe/104 and PCI/104-Express specification will provide an avenue for the rugged PC/104 architecture markets to expand. For more than 15 years, PC/104 has been synonymous with words like versatile, expandable, rugged, miniature, solid, and long life.